Which is windier Dahab, Egypt or Poole Harbour, UK? Well, maybe it was too good to be true. Having been out in Dahab, Egypt for just coming up 1 week there has been a big fat ZERO days of wind! On the other hand back home in Poole Harbour I believe there has been a good few days of breeze! Out here in Dahab, the normal pattern of cooler nights creating a strong offshore wind in the morning just hasn’t been happening for a few weeks now! In fact, we have been having just the reverse weather pattern out here. An onshore wind that starts light in the morning & builds with a sea breeze in the afternoon, much as we get back home on a nice summers day. All this doesn’t exactly make for epic windsurf training ground right now but it has helped me to explain to you what to look out for when planning a windsurfing trip out to Dahab, Egypt. Next week is looking to go back to normal & I should be able to report on how the windsurfing out here compares to good old Poole Harbour. I am hoping that we get enough water time to give a low down on how the conditions are for carve gybes & advanced windsurf freestyle. 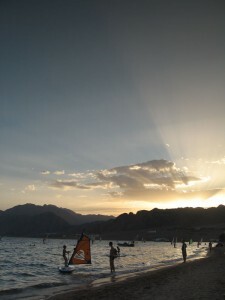 Egypt – Is it the No 1 windsurfing holiday destination?